There's a new Star Trek series on the air for the first time since 2005 and it's caused a firestorm of controversy among the fans. Here at Geek Twins, we're going to weigh in on it, but we'll be breaking it up to examine it piece-by-piece. First, Nigel reviews the first two episodes of the first season of Star Trek: Discovery. Star Trek: Discovery is a brand-new series set in the Star Trek universe ten years before the original series. In the new series, we see a new ship and a new crew dealing with the problems leading up to the world of the 1960s version. However, the show is a radical and welcome departure from the Star Trek TV series of the past. Discovery is only available in the United States by subscribing to CBS All Access, a subscription service like Netflix for CBS-owned TV shows. When Star Trek: Discovery opens, we're introduced to Michael Burnham (Sonequa Martin-Green). 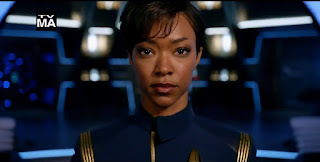 Michael Burnham is an African-American woman raised by the Vulcans and serving as the first officer aboard the Federation starship USS Shenzhou. Obviously, there are several rather unique and almost shocking twists just in that last sentence, so let's unpack it. First, you have a woman named Michael. Not a typo. Second, you have an African-American woman as the lead character on a Star Trek show. She's not the first African-American on a Star Trek show, and not the first black woman on a Star Trek show, either, and she's not the captain, but she really is the focus of the show in a way we've never seen before. Third, she's a human who was raised by Vulcans which gives her a unique perspective like never before. It's not just that she's logical but she is also more emotional. She looks at the Vulcans the way Spock looked at humans: from the outside, even while within it. We also meet her captain, Phillipa Georgiou (Michelle Yeoh), who commands the Shenzhou. The big departure of Star Trek: Discovery starts here, because Georgiou is not the lead character. For once, the focus of a Star Trek series is on someone other than the captain. It's also not an ensemble piece. We learn almost nothing about the rest of the crew in the first two episodes, but we get numerous flashbacks and details about Burnham. She's the hero for reasons that will become clear by the end. In the pilot two-part episode, Burnham and her crew are undergoing a routine investigation of a damaged probe when they're involved in a conflict between the Federation and the Klingons. The Klingons, at this point, are not united in an empire, but are a collection of Houses still fighting in civil wars. The incident draws them together like never before. Led by a rogue Klingon named T'Kuvma, the Shenzhou is forced to face the Klingons for the first time and Burnham tries to make the Federation understand their threat. Things don't go well. The look and feel of the show are very different from previous shows. The Federation ships have windows instead of viewscreens, so there's a lot of ambient light. The bridge also feels more like the movies with a lot of floating screens and panels instead of buttons and switches. I want to say here that the biggest complaint people have had about Star Trek: Discovery is that it doesn't fit into the chronology of technology of the timeline. Like I said, they don't use viewscreens but having holographic projections of people that even walk around while people are talking to them. 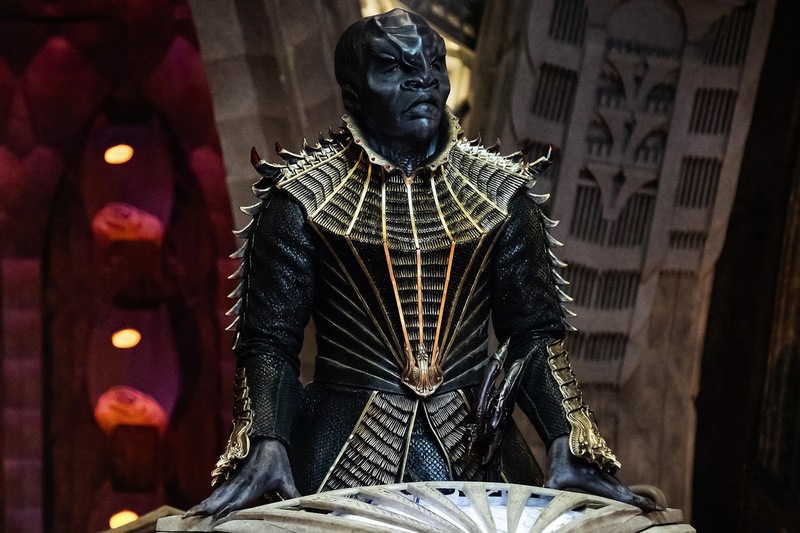 Also, the Klingons look even more different than they did in Star Trek Into Darkness, so fans are outraged they don't look like the brown-skinned ridge-less Klingons of the Original Series, much less the ones from Star Trek: The Next Generation. We'll get into that in another post, but I think if we pretend the series is set in the future of The Next Generation, it's easier to deal with. Discovery wants to make a modern show for modern audiences that are used to the movies and has decided to move forward instead of backward. I think it's a good decision and the show looks gorgeous. By the end of the episode, things change drastically. I don't want to spoil it, but I will say that the episodes don't end with everything back to normal and the Shenzhou heading off on a new adventure. In fact, the Shenzhou doesn't head anywhere at all. Burnham is left devastated and we're not sure where she goes from here. I'm looking forward to finding out. In these two episodes, we also see a much less calm and organized Federation. Burnham doesn't just strongly disagree with her captain and then give up. She pushes further than I've ever seen a crew member on a Federation ship go before, and her actions have meaningful consequences. Discovery obviously decided not to go with Roddenberry's vision of a future where everyone gets along, and I think the show is better because of it. I know a lot of fans are divided over the new show, but I think it's really solid. It looks and feels great, and there are real emotions and drama. It also feels like Star Trek, more so than the new movies, and I think it also has more action than the older shows. It also has a different arc where things change instead of staying the same. I was shocked by how the second episode ended. Is Star Trek: Discovery worth subscribing to CBS All-Access? I'll get into that in another post, but I think it's worth at least subscribing to the free one-week trial to check it out. That's what I did. Saw the first episode and had issues with it - Klingons, plot contrivances big time, inconsistencies. I'll watch all of it eventually, but the first episode didn't do it for me. Sorry, Riker would never have done that to Picard. Star Trek didn't need to be edgy. It needed to be Star Trek.